The ergonomically designed new ultra-thin Sanyo Xacti DMX-CG6 comes for the first time with blur correction Gyro Sensor for photos and can record high-sensitivity movies in low light. The Xacti DMX-CG6 employs Sanyo’s newly developed proprietary image-adaptive data processing technology, which enables you to shoot MPEG-4 movies and 6-megapixel stills simultaneously. Movies are recorded clearly, with TV-like picture quality (VGA/30 fps). The Xacti CG6 also features a 60 fps playback function for smoother movie playback on your TV screen, along with high-sensitivity technology that enables you to shoot beautiful movies even in dark locations. The Xacti DMX-CG6 comes equipped with a high-powered 5x optical zoom lens. Used in conjunction with the 12x digital zoom, it enables up to 60x zooming capability. 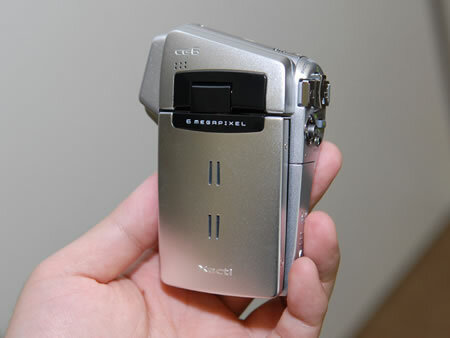 The camera is SDHC memory card compatible (4 GB SDHC memory card compatible). The Xacti DMX-CG6 features a 2.5-inch amorphous silicon color TFT LCD with a high resolution of approximately 110,000 pixels with 100% coverage and 7-level brightness adjustment. The Xacti DMX- CG6’s ultra-compact design (68 x 100 x 35 mm) and lightweight 168 g (including battery and SD card) body open up a range of shooting possibilities. Simple, slim and elegant- just like an accessory – this portable digital movie camera with iPod and iTunes compatibility can be used easily with one hand, without putting strain on your wrist. The stylish vertical design also makes it easier to keep your arm steady during use. The Xacti DMX-CG6 is available in three different colors-Silver, Pink and Blue and will be available from late November for approximately 50,000 Yen ($430).